During the summer season its common to have a cruise ship anchored in the Bay and occasionally a large private launch or yacht. 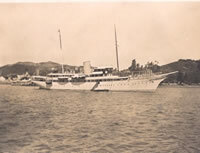 This photo from 1932 shows Lady Yule’s steam yacht Nahlin anchored just off Russell wharf. This elegant vessel was commissioned by Lady Yule from GL Watson &Co, Glasgow and used by her for extended cruises including a circumnavigation. She was later made available for charters including summer 1936 when King Edward VIII took his lady friend Wallis Simpson on a cruise and precipitated his Abdication. She was bought by King Carol of Romania but later languished on the Danube where she was discovered fifty years later in a sorry state being used as a floating restaurant. Privately purchased she retuned to the Clyde where she is being gradually restored. Maybe one day we will see her anchored off Russell again. And Lady Annie Henrietta Yule? She was the widow of Sir David Yule who had amassed a fortune in India. Lady Yule and her daughter established an Anglo Arab horse stud at Hanstead, Hertfordshire, UK whose progeny spread all over the world.